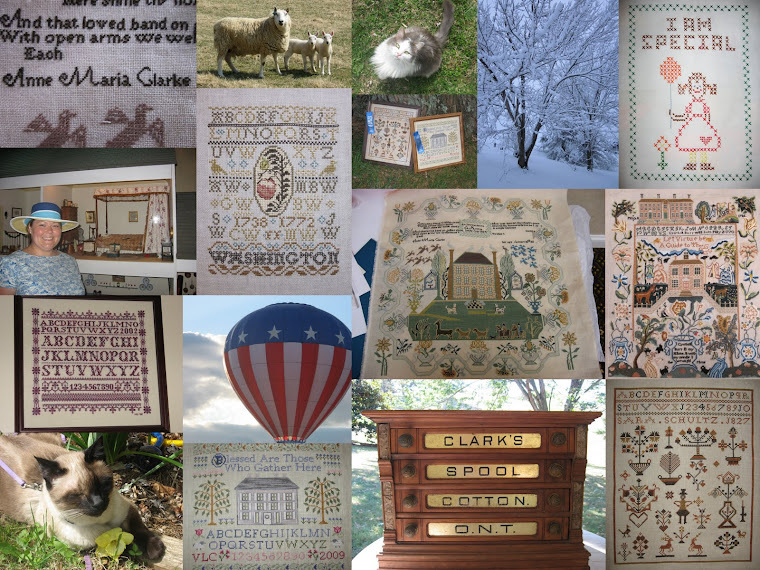 A Shenandoah Sampler: Progress is progress...I guess, I guess! Progress is progress...I guess, I guess! I hope that everyone had a fabulous fall weekend! I had a wonderful time at home. It was the first weekend I have spent completely at home in months and it was glorious. I cleaned and stitched and loved every minute of it! It was difficult getting up to go to work this morning but it was made easier by the fact that we only have a half day of school today. It was a teacher workday to begin with but my principal decided to give us leave at 12:00! We have had a very difficult and long couple of weeks. I don't teach in a "normal" school (if there is such a thing!,) I teach in a school that is located within a psychiatric hospital for children and adolescents. October is a very busy time because we have numerous admissions. We have been at capacity for several weeks and we are all feeling a little crazy! Our principal decided to give us a half day off just to say "Thanks for doing what you do!" I have had several friends ask "Why is October so busy?" Well, we are not sure but we think it is because generally schools have been in session for over a month and children with mental issues begin to present their abnormal behaviors more frequently after the few beginning weeks. Those of you who teach school (or just have kids in school) know that there is a "honeymoon period" at the beginning of every school year. It lasts from two to four weeks. If there is a student who is possibly struggling with a mental illness/behavioral illness, it usually takes about four to six weeks before any serious intervention is made. Students with serious mental issues (many are behavior related, such as oppositional defiant disorder) are then sent to the center where I work. It is operated by the state and is an acute care facility. Students live at the center (similar to a hospital) so that they can receive around the clock psychiatric care. They are also provided with a true school experience so that they do not get behind in their studies. I teach teach World History and middle school social studies and some elementary social studies. So, I work with students in grades K-12. In short, I teach the kids that nobody else can momentarily deal with. We try to stabilize children so that they can return home and continue moving forward. The job can be stressful but in the end it can be very rewarding. I am almost finished with the over one verse...thank heavens I only have about three to four lines left. I have Anne Maria Clarke's name still to stitch (on the left above the birds) but I have decided to wait till the end to "sign" it for her! I just love this sampler and even though I am sure that I will still be stitching it a year after starting it (February 2010,) I am happy to be comfortably stitching with Miss Clarke. When I find myself wishing her finished (which I must admit, is quite often) I go to visit Margaret over at Days of a Sampler Lover. She is currently stitching the beloved Richmond Sampler as well and making significant progress. I have thoroughly enjoyed watching Margaret stitch this sampler and I have also enjoy dreaming that her progress is MY progress! The birds on the left are looking a little lonely, they are supposed to be flying over the house. Guess I should help them out and start on the house next? I also made some progress on my Mom's Christmas present, La D Da's "Bushel and Peck." This is a special piece for me...my mother used to sing the "Bushel and a Peck" song to me as a child. At the end of the song, when she sang "hug around the neck" she would grab me, give me a huge hug and shower me with kisses. I am 34 years old and still feel warm and fuzzy inside when I hear that song! So, when I saw the model stitched at my LNS, I knew that I had to stitch it for my mother. I am using a different fabric than what is called for and different threads (they escape me now) but I like what I have stitched so far. I also started another project, Cinnamon Stick Christmas IX "Santa and the Merry Animals" by Homespun Elegance. Teri, the owner of my LNS has several of these model Santas in her shop. I have always loved them and decided this year I would stitch one. Santa can be stitched on linen as a framed piece or he can be stitched on 7ct. Klostern as a 3-D free-standing Santa. I am stitching on the 7ct Klostern with the hopes of finishing him to stand freely. So far, I have only finished his mittens. I am stitching with DMC since this Santa EATS thread. I hope to have more to show later. Well, thanks to everyone for stopping by and making my day! Your wonderful comments mean so much! Oh, and a big thank you to everyone who commented about my Clark's Spool Cabinet. Yes, I realize that I am VERY lucky to have one and I promise, once I get her polished up, I will share more pictures! Happy Stitching! Valerie, your Richmond Sampler is looking fantastic! Isn't it great to almost be done with the verse? Somehow the verse tends to be what I dread most in a sampler. lol! I love what you're making for your mom too. La D Da has another piece with a song on it that reminds me of when my daughter was little -- I keep saying I'll stitch it for her but haven't yet. I should! Love the HE Santa too. Her Santas are just wonderful! I can see how work must become stressful in October -- what you say makes so much sense. But what you do is so important for the kids in your school. My son had issues in second grade and I was so grateful to the staff who helped to evaluate him and get him settled and happy again. So thank you for what you do! Wow Valerie your sampler looks as gorgeous as Margarets and admire you, also stitching a lot of queen stitches!! Terrific progress on your Richmond Sampler! Great beginnings on the HE Santa and LDD's Bushel and Peck as well! Glad you had a bit of free time thanks to your principal! Your sampler is on its way to being a work of art. You will have to have a par-tay when you're finished! The HE Santa is so darling! I have looked at those many times, but the fact that they literally devour thread has deterred me. :) I can't wait to see yours done. You'll have to show how you finish it to stand up. I assume you will fill it? Sampler is looking great !! Thanks for sharing about your job. Wow, loved hearing about your work!!! It sounds very challenging but hopefully it is rewarding as well :-). Love your stitchy pictures too!! I am regretting not signing up for the Richmond Sampler class. Valerie you have been a busy bee both at work and stitching !!! I think your work will make a big difference in the life of the children you teach, so you should be proud and rewarded. Your Richmond Sampler is beautifully coming along. You and Margaret are my inspiration !! Valerie, you are making great progress! I need to take another picture of mine and post it - I am trying to finish the border before doing all of the fun inside stuff and I'm down to the bottom. That verse took forever and I was so glad when it was done! Keep it up, your sampler is beautiful! Will I see you at The Gathering this year? Sounds like you have a very challenging but rewarding job. I'm sure the parents are grateful for what you do. Love the progress on your Richmond Sampler and LDD. I really love that Bushel and a Peck design too! Your Richmond sampler is going to be amazing no matter how long it takes you to finish up! Have fun with your other WIPS, too. Richmond Sampler is looking wonderful and I love your new starts. I applaud you for doing such an extremely challenging job - I'm glad your principal recognised the effort you all put in. Love your blog, it is my first time checking in, hope you check mine out. I am totally addicted to cross stitching. We have a stitching group called The CrossStitching Sisters. There are 18 of us and we truly are sisters. I love your WIP, so lovely. I too teach school and I know what you mean about October being the month the children start to really test us. I have noticed that each and every year of teaching!